Volvo Glossary: Definitions of Volvo car lingo, terminology and abbreviations. Volvo abbreviations explained here, with links to various Volvo information. Hello Volvo car owner! Here is a Volvo Glossary for you to understand Volvo terms and abbreviations. Please contact me if you can’t find what you’re looking for, and I’ll add it. 854 Slang for a Volvo 850 sedan (4 doors). Applies to all series, for instance 744, 244 etc. 855 Slang for a Volvo 850 wagon (5 doors). Applies to all series, for instance 745, 245 etc. Blue Box Slang for “OEM Volvo Part”, OEM being slang for “original equipment manufacturer”. In summary, blue box parts are made by (or for) Volvo, are generally higher quality and more expensive than other brands of replacement parts. The term comes from the fact that Volvo OEM replacement parts’ boxes are blue. Brick Old school Volvo (many newer Volvos have some degree of Brick DNA). Affectionate term of Volvo lovers! CBV The Compressor Bypass Valve allows the outlet pressure of the turbo to vent back into the intake of the turbo which keeps the air within the system and prevents a potentially rich condition. See much more about CBVs, including the theory behind them, and alternatives to them. CEL Check Engine Light I also see it referred to as a MIL which I think is a Malfunction Indicator Light. CPS 1. A part used on Volvo engines to monitor the position of the crankshaft. This information is used by engine management systems to control ignition system timing. 2. CPS also stands for clutch position sensor. CVVT Constant Variable Valve Timing – the timing of intake and exhaust valves is set independent from one another, “on the fly”. Some examples are late intake valve closing, early intake valve closing, early intake valve opening, and early/late exhaust valve closing. Wikipedia’s CVVT page. DiCE Diagnostic Communication Equipment–the replacement for the VCT2000; a diagnostic connection box that connects VIDA to the car. DIM Driver Information Module — expensive unit in the dash pod that controls and monitors many of the car’s functions. FPCM Fuel pump control module. Likely the same as PEM, but given a different name depending on the model. HPT High Pressure Turbo, as opposed to LPT, meaning a low pressure turbo,. As opposed to N/A, which is shorthand for a normally aspirated (no turbo) Volvo car. HPT cars produce more horsepower and torque than LPT or N/A cars. Read the Fast Friday Performance entry discussing the difference tuning an LPT vs. HPT Volvo. Limp Mode When something goes wrong on automatic transmissions the Volvo goes into a “limp mode” where it is drivable but it will run like crap. Essentially the car “limps” home. On 850/S70/V70/XC70 models this starts the car from a stop in 3rd gear. May have a flashing arrow on dash. LPT Low Pressure Turbo, as opposed to HPT, meaning a high pressure turbo, or N/A, which is shorthand for a normally aspirated (no turbo) Volvo car. LPT cars produce more horsepower and torque than N/A cars, but less than HPT cars. 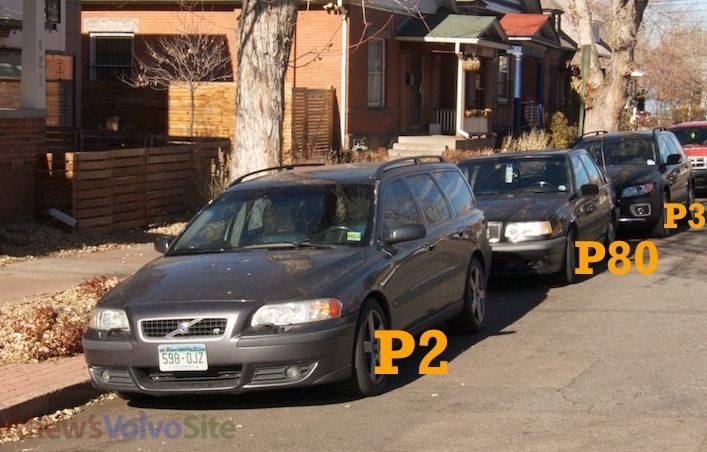 Read a user’s question regarding the difference between LPT and HPT in the Volvo Forum. OBD Onboard Diagnostic (System?) Set of standard for self diagnostic features in the engine control system, primarily for emissions reasons, but useful for other diagnostics. OBDII or OBD2 (not spelled “OBD11”) Second generation OBD system, includes a standardized fault code table and 16 pin communications connector. Commonly used to refer to the code reader / codes stored by the diagnostic system and read with a universal scanner. OEM Original Equipment Manufacture. It means a part is made by Volvo or made by the company that made the part that went into your car at the factory. Oil Trap Part of the Positive Crankcase Ventilation (PCV) system which does, literally, trap oil that circulates through the PCV. It requires periodic cleaning or replacement to keep the PCV working properly. P1 Platform The Volvo P1 Platform was used in the Volvo S40 and V40 compact car’s second generation. These were introduced in 2004, and that model year was known as the “2004.5” model year. Also, all of the Volvo C30 model years were P1, as well as 2006 and newer C70. These cars were built in the Volvo factory in Ghent, Belgium. See a P2 vs. P80 vs. P3 photo. See the MVS Volvo P2 page. P3 Platform The Volvo P3 platform is shared by almost every Volvo model sold in North America in the late 2000 decade to the mid 2010s. The P3 Volvos are durable and reliable, subjectively better than the P2 cars. The P3 is identical to Ford’s “EUCD” midsize car automobile platform. See a P2 vs. P80 vs. P3 photo. P80 Platform The Volvo P80 Platform was the foundation (chassis, electronics, etc) upon which all of Volvo’s 1992+ front-wheel- and all-wheel-drive models were based on. Models included the 850 up to 1997 (its last year) and S70, V70, XC70 (V70-XC), C70 models up to year 2000. See a P2 vs. P80 vs. P3 photo. PCV Postive Crankcase Ventilation…on our Volvo’s it’s a series of hoses connected from the accordion air intake hose all the way to the oil trap (also called the separator or breather box) under the intake manifold- when it get’s clogged up, positive pressure builds up in the engine and can cause engine leaks. PEM Pump electronic module. Likely the same as FPCM, but given a different name depending on the model. Platinum 850 Offered only in 850 model year 1996, the Platinum Edition 850 was a limited-run of 1500 cars in the US. Every option was standard, as was a special “pearl white platinum ” paint and special wheels. PNP Park Neutral Switch on automatic transmissions. Essentially tells the transmission what gear the shifter is in. Common failure point and there are a bunch of threads about the subject. R134a 2-Tetrafluoroethane, an environment-friendly refrigerant used in Volvo AC systems since the early 1990s. A gas at temperatures above -26.3 °C (-15.34 °F). In the US, it replaced dichlorodifluoromethane (R-12, “freon”). Old R-12 automobile air conditioning systems can be converted to R134a with conversion kits. SAS Secondary Air System part of 1990s-on Volvo cars, this recycles rich exhaust gasses back into the engine to be burned when the car is started when cold. The air pump and SAS valve are responsible for this process, and when they fail they set off code P0410. Here’s how to do what’s called an SAS Delete, which tricks the Volvo’s computer into thinking things are ok even if the valve or pump fail. Whoohoo! SPA Platform Scalable Product Architecture (SPA) platform — The SPA platform is used for the entire range of Volvos newest models: the XC90, the S90, the V90 and its buff twin V90 Cross Country. It succeeds the P3 Platform as the primary building block for all mid-large Volvo cars and SUVs. Its importance to Volvo cannot be overstated. Spirited Driving Conveyance at extralegal speeds, especially on non-freeway secondary highways. Associated with grinning. SRS Supplemental Restraint System: As an enhancement to the three-point seat belts, Volvos are equipped with a Supplemental Restraint System (SRS). Volvo’s SRS consists of seat belt tensioners, front airbags, side impact airbags, the occupant weight sensor, and inflatable curtains. All of these systems are monitored by the SRS control module. Stop Neutral Sometimes abbreviated as “S/N”. Software Volvo implemented in some 2001 models’ transmissions that shifted the transmission into neutral when the car came to rest. The 2001 V70 for one was notorious for failed transmissions on 2001 models because of this feature. The driver could not control this behavior, and the shifter itself didn’t move. The stop neutral code was removed by a software update that came out years later and was delivered to cars at dealers via VADIS or VIDA. VADIS Volvo’s own internal repair documentation & diagnostics environment, now deprecated. Read about VADIS here. VCT2000 The actual interface cable / box used to let a computer running VADIS talk to a 99+ car. Typically used in the context of “I need a VCT system to check that” or “I wish I had one” Very expensive and hard to fine, but really fun to have. Officially deprecated by Volvo on October 15, 2009. VIDA Volvo vehicle information / communication software, the successor to VADIS. VOL-FCR software Laptop / PC based diagnostic tool for Volvo cars made between 1996 and 1998/9 and some other models onwards. VST Volvo Scan Tool. Used to talk to computers on 96-98 cars. Unfortunetly nessessary to read / reset fault codes for the trans, climate control, srs, etc. Some functionality can be duplicated with the VOL-FCR or OBDII software. VVIS Volvo Variable Induction System. This applies to the ’93 – ‘94.5 850 intake manifold with a vacuum actuated vane to switch between a long or short runner within the manifold at a set RPM for torque, and/or fuel savings. Side note: They function better when the actuation order is reversed with a device that fools the electronic vacuum solenoid as to RPM. VVT In internal combustion engines, variable valve timing (VVT) is the process of altering the timing of a valve lift event, and is often used to improve performance, fuel economy or emissions. It is increasingly being used in combination with variable valve lift systems. There are many ways in which this can be achieved, ranging from mechanical devices to electro-hydraulic and camless systems. Increasingly strict emissions regulations are causing many automotive manufacturers to use VVT systems. VVT on Wikipedia. White Block Engines Volvo Engines with aluminum blocks, debuted on the 1992 (North American model year was 1993) 5-cylinder Volvo 850. WOT Wide open throttle. Or “putting the hammer down”, or “pedal to the metal”, or… any number of euphemisms for mashing the gas pedal. Have something to add? Reply to this Volvo forum topic and I’ll see that your term/definition finds its way to this list.